Homemade Shout Stain Fighter | Are We There Yet? I’m really into homemade cleaning products lately. Anything that saves money, is easy to make and involves mainly stuff I have on hand is where I’m at. 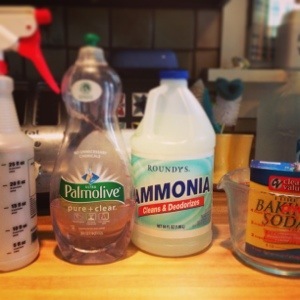 So, when I found this homemade Shout stain remover recipe on Pinterest, I HAD to try it. Especially when I realized I keep everything on hand except Ammonia and I can pick that up for $1 at the grocery store. Mix well, add to spray bottle. Shake bottle if solution has been sitting for awhile. Use as normal shout would be used but I’d suggest rubbing the sprayed area together. I’ve tried it on three items so far: one with dried formula puke, one with markers and one with what appeared to be blue ink. All three were gone without rubbing but I’d suggest it for more set in stains.